I would like someone to speak to... REQUIRED (Select One) Myself My Youth Group My Parish Please fill out this field. We invite you to join us for a week on the campus of the University of Notre Dame. Here, 70 Notre Dame&apos;s college students will lead you in an exploration of God’s call and the ways in which you can respond to this call with your own gifts. You will have a chance to immerse yourself in the spiritually and communally rich environment of the University. You will benefit from some of the best speakers from across campus and across the country whose stories, witness, and humor will challenge you to expand your imagination and deepen your faith. Whether you are in our large group setting as one of 360 teenagers from across the country or in the small group with 7 other teens your own age, you will find yourself in a vibrant and welcoming community that is committed to authentic prayer, good conversations, and real life issues. Notre Dame Vision is for all high school students. Everyone wants to know who they are and where they are going in life. Notre Dame Vision helps young people on this journey. Participants may come alone, with a few friends, or in groups of five or more. Notre Dame Vision is open to students entering grades 9-12 in the fall of 2019 or graduating high school in the spring of 2019. Notre Dame Vision is a series of 5-day conferences that includes dynamic large group experiences, reflective small group time, profound liturgies, and excellent music. Speakers from all across the country will break open important themes throughout the week and help participants to relate them to their own lives. 70 Notre Dame undergraduates will serve as Mentors, whether as musicians or small group facilitators. The University of Notre Dame is the beautiful setting for these conferences. Participants will be housed in student dorms and will eat in the dining hall (one of the best in the country!). 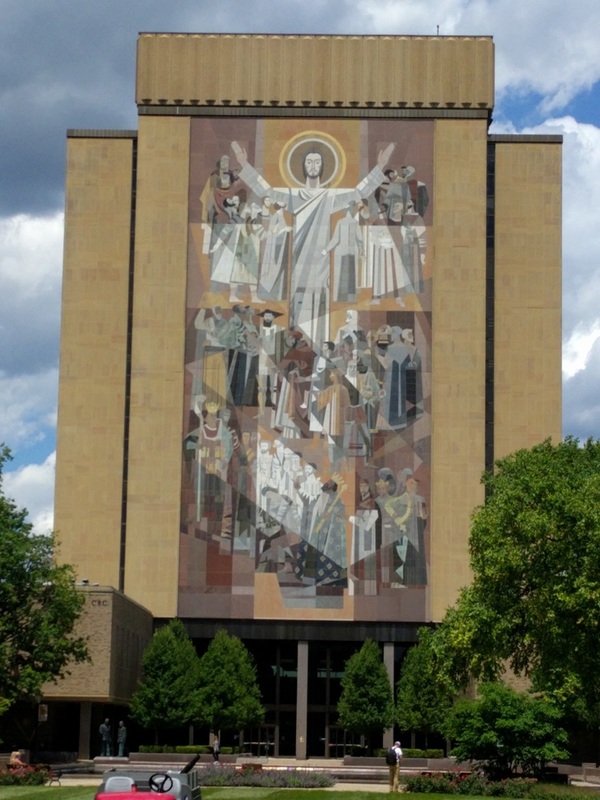 The campus is a great location - with idyllic lakes, walking paths, athletic facilities, and restaurants, Notre Dame is located 90 miles east of Chicago, in South Bend, Indiana. Application on the right panel or here! Please print out and mail it to the Diocese Office with your $100 registration deposit. 1790 Popps Ferry Rd BIloxi, MS 39532. Please make checks payable to "Catholic Diocese of Biloxi." Please make sure not to delete or change fields we&apos;ve filled out for you already! This registration and initial deposit for the scholarship is due February 20th 2019. We&apos;ll be in touch with you with follow-up more information we&apos;ll need. We&apos;ll also notify you of a parent meeting prior to our departure date. Total cost is $635 and we&apos;ll have a payment plan calendar established to make the cost manageable. Do not let cost be a factor for not going.